Illustration courtesy of Browning North America. New from Browning's extensive clothing line is their “Bird'n Lite” series of vests and jackets, with the upland jacket reviewed here. Here's what Browning has to say about this hunting jacket. 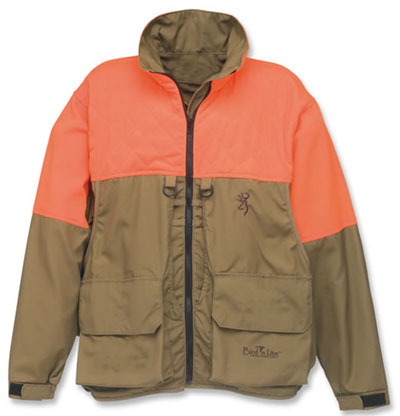 The jacket itself is well-made and similar in that respect to several other high quality upland hunting jackets. There is one critical difference, though, that being the harness system. Similar to buoyancy compensators for scuba diving or to backpacks, the Bird'n Lite has a built in harness system that secures the jacket. The benefit is more comfort when loaded up with shells, electronic dog collar transmitters and birds. It also makes this vest more adjustable than others, ideal for everyone but particularly good for female or younger shooters. The more you carry with you and the more birds you bag, the more you'll appreciate this jacket and how its fit and comfort is unaffected by adding weight. Retailing at $170, you can pick this jacket up for about a hundred dollars at major discount retailers. It is well-made, extremely comfortable and does exactly what it promises to do. It lets you carry more weight without any loss of comfort. The added adjust-ability and subsequent better fit might make it your first choice, regardless of what you typically carry.